Fall in Wisconsin is covered in colors worthy of extra oohs and ahhs. A great way to experience this is with a scenic drive. Here are the best fall color drives in Southern Wisconsin. Hwy 35, Wisconsin's Great River Road National Scenic Byway. Amy is a mother of four, grew up on a dairy farm and truly loves this little corner of the world. Sunfish Overlook is the perfect spot to catch views of Lake Onalaska. Enjoy a sunny, fall day on the patio at Red Pines Bar & Grill - the catfish tacos paired with Pearl Street Brewery's Downtown Brown are a must! This area is perfect for eagle watching - what a thrill. It's equally amazing when you spy a nest, so keep your eyes peeled. Hit the bike trails at Perrot State Park. Eat the Best. Pie. Ever. at Stockholm Pie and General Store. Sip at Elmaro Vineyard on the Great River Road Wine Trail. Celebrate Oktoberfest USA in La Crosse in September. See the Mississippi River from the Historic Trempealeau Hotel. Take your best buddy hiking at Wyalusing State Park. Witness a fall color explosion near Prairie du Chien. The Roller family loves to hike, camp and literally can’t sit still for more than two hours at a time. The Tamarack Trail around Mauthe Lake is fall hiking at its finest. Climb Parnell Tower for expansive views from 60 feet in the air. It gets crowded, so go early! The Hamburger Haus is a classic stop for big ice cream cones and tasty burgers for locals, tourists and Harley riders alike. 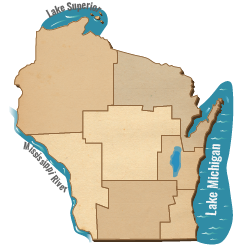 Visit the past at Old World Wisconsin Historic Site. Plan a road trip in Kettle-Moraine State Forest - Southern Unit. Climb the 192-spire at Holy Hill for picture perfect view. Climb the Parnell Tower for a bird's eye view of brilliance. Let loose in Kettle-Moraine's Northern Unit. David is an avid outdoor junkie and loves his job at the Department of Tourism. The spot for perfect fall color, with a stunning view of the Kickapoo River Valley, is the observation point at Wildcat Mountain State Park. Along the drive, keep your eyes peeled for Amish carriages and locally produced food at area farms. No trip is complete without a local brew and a signature square pizza from the Hillsboro Brewing Company. Chug through fall on the Mid- Continental Railway. Hike the lakeside trails at Devil's Lake State Park. View the Driftless Area from Wildcat Mountain State Park. Treat yourself to award-winning Carr Valley Cheese. Maggie is a 40-year resident of the Wisconsin Rapids area, and thinks fall makes a great favorite season. The best place to see fall colors is anywhere overlooking the beautiful Wisconsin River. A short bike ride along the river in Wisconsin Rapids offers charming fall color views. On weekdays, stop by Great Expectations for lunch, (try the chicken salad sandwich on cranberry wild rice bread!) and don't go home without a couple (or a dozen) freshly-made cupcakes. Enjoy harvest time along the Cranberry Highway. Shop at Rubi Reds for cranberry gifts galore. Go crane gazing at Sandhill State Wildlife Area. Learn about all things cranberry at the Cranberry Discovery Center. Rustic Road 54: North Settlement Road from Hwy O in Black River State Forest. Beautiful any time of year, these backroads are some of Wisconsin's best spots for fall color, with history and hidden gems tucked along each crest and curve. You can't go wrong with any of the state's 119 rustic roads. View the guide and interactive map to plan your next drive! Explore our trip ideas to get inspired for your next Wisconsin vacation. Check out some of the best fall drives in the northern part of the state!